It's been almost four years since a 7.0 magnitude earthquake ripped Haiti apart, leaving, by some accounts, more than 250,000 people dead, another 300,000 injured, and more than 1 million without homes. The country's hospitals were hit hard. And even though certain things have improved, Mary Wehde, who has traveled to Haiti three times with Mayo teams, says the country's caregivers are still struggling to find enough medical supplies and medication to treat all those who need their help. Having returned from her most recent trip a few weeks ago, Wehde says she and the other Mayo volunteers who've visited the country have seen progress. But she says there's still much that needs to be done. "I've been there three times in the last year and a half," says Wehde, who has great praise for the local care providers. "Their skills continue to advance -- the physicians know more, the therapists know more, their pharmacy is more organized than it was." But the lack of supplies, she says, limits the good they can do. Despite this, Wehde says the Haitian people she's met haven't let their misfortune break their spirit. "The one thing I've found with the Haitian people -- almost everyone I've met -- is that they have this amazing, remarkable spirit," she says. "They endure, they're happy, they're strong people. It's stunning to me that with as little as they have, they don't complain. They still find a way to share it." 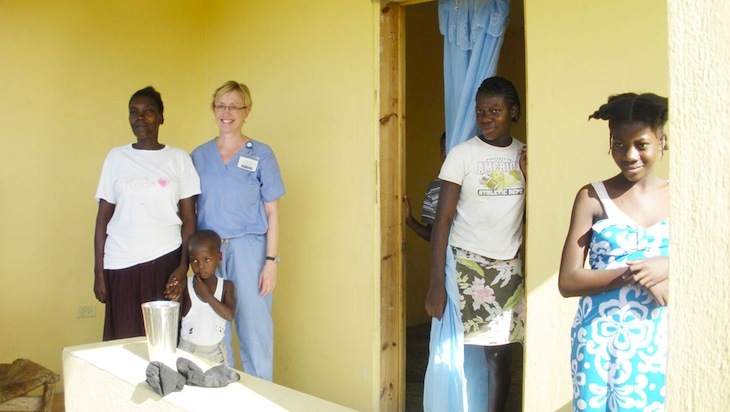 Wehde and other Mayo volunteers have focused much of their effort on helping to provide patient care and education at St. Luke's Hospital in Haiti. "It's an interesting environment," she says. "No food is supplied in the hospital, so families have to bring food in. We had one patient who was very malnourished and had multiple other issues. They gave her an IV, but when she got the fluid in her, she just swelled up … She had no protein in her system." The Haitian physician who was helping translate asked the patient's family if they could bring something that had protein in it. "But they said they had no money for food," Wehde says. "You just want to reach in your pocket and hand them 10 bucks, but then you go to the next bed and the story repeats itself." Wehde says it's experiences like this that have kept her coming back to Haiti and that have made her continue to want to do more to help. "You feel like when you leave that what you've done is only a drop in the ocean," she says. So she and others are hoping to add a few more drops to that ocean by hosting a fundraising event this Saturday, Dec. 14. The event is not sponsored by or affiliated with Mayo Clinic, but Wehde says she hopes it will help continue the good work of the Mayo volunteers, since all money raised will go directly toward helping to provide medical supplies to St. Luke's Hospital. For more information about the event, email Wehde or click here to visit the event's fundraising webpage. Then, don't forget to let us know what you think about this story and others by sharing a comment below. Very well said Mary, your thoughts and experiences were the same things I and my team felt, when we were down in Oct. ’13 with a Vascular Work Group.